Gov. 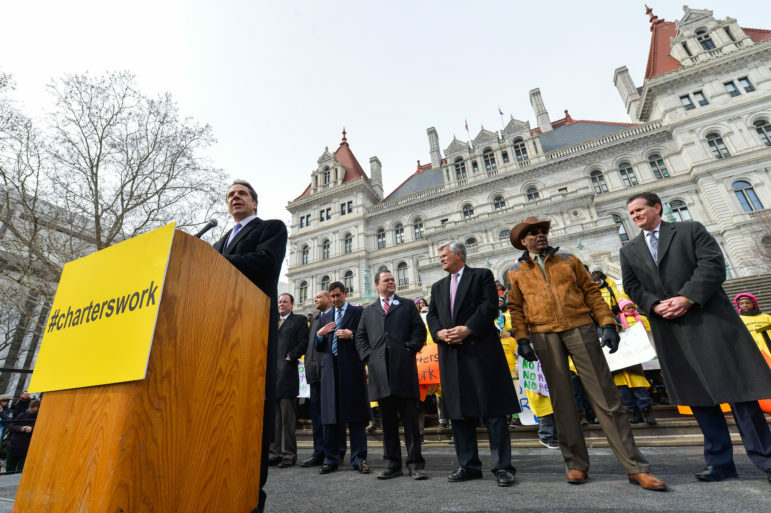 Cuomo at a 2014 rally supporting the charter school industry’s demands for free space in existing public schools. Early in his tenure, Cuomo embraced many elements of the education reform agenda, but he has since moved away from some of those positions. * * *Education may not play the same outsized role in the run-up to the general gubernatorial election as it did in the primary when actress and education activist Cynthia Nixon threw her hat in the ring, but candidates in the crowded race have weighed in on curriculum, the cost of college and the role that testing plays in the classroom. Marc Molinaro, the Republican candidate with a daughter on the autism spectrum, has taken a particular interest in programs to support children with special needs, while Gov. Andrew Cuomo touts his college scholarship program and the state’s investments in pre-K.
Molinaro has called for The Early Intervention Program, which supports infants and toddlers with disabilities, to be fully funded by the state. According to Erin Silk, spokesperson at New York State Department of Health, the program is jointly administered by the state and county, with the state’s expenditure for the 2016-2017 program year at $167 million and local expenditure at $173.4 million. She said approximately 69,000 infants and toddlers receive no-cost services annually from the program. Molinaro also says preschool special education, which provides educational and support services to children ages 3 to 4, should be administered by counties, which help pay for the program. The State paid approximately $858 million for special education services for preschool children in the 2017-18 state fiscal year, which costs approximately $1.5 billion annually. Jeanne Zaino, professor of political science at Iona College, says Molinaro’s position speaks to a level of local “discontent” over unfunded mandates and that as a county executive himself, Molinaro has firsthand knowledge of these concerns. For his part, Cuomo has focused his early childhood efforts on the state’s pre-K program. In September, $15 million in funding was made available to fulfill the governor’s 2018 State of the State promise to establish pre-K programs for 3- or 4-year-olds, with preference given to high-need school districts without a state-funded pre-K program. The governor boasts that in 2013 he created the state’s first full-day pre-K seats and, in 2015, expanded pre-K to serve 3-year-olds. “While the governor has made early education a priority, it’s hard not to see it as following in the mayor’s footsteps, which is something he probably would not like,” Pallas added, noting that Cuomo has the same problem with community schools, which partner with community organizations to promote the holistic development of children and youth. Howie Hawkins, the Green Party candidate, calls for full-day developmentally appropriate pre-K and kindergarten for all children, taught by certified and unionized educators. Pallas calls his proposal “commendable” but says issues arise with unionization, in part, because it’s unclear which union these early childcare workers would affiliate with. Cuomo previously pushed for a teacher evaluation formula in which tests loom large, something teachers lobbied against but was nevertheless adopted. More recently, Cuomo has gotten behind legislation that would prevent the state from using state exam results to evaluate teachers and to instead use “alternative assessments.” He also accepted a task force’s recommendation for a moratorium on using the test results to rate teachers through the 2018-2019 school year. During his 2010 campaign, Cuomo advocated for Common Core standards but later backed away from that position. In 2017, Next Generation English Language Arts and Mathematics Learning Standards were introduced after Cuomo convened a task force amid the opt-out movement that recommended a Common Core overhaul. Molinaro has voiced concerns about high-stakes testing in his role as county executive and has spoken out on the testing culture as a candidate for governor. However, he marched over the Brooklyn bridge in June to send a message to the city not to eliminate the Specialized High School Admissions Test entrance exam–which de Blasio has called for scrapping–for the city’s elite specialized high schools like Bronx Science and Stuyvesant. Cuomo has previously been dismissive of getting rid of the test but has stopped short of taking a firm position on the issue. Larry Sharpe, the Libertarian candidate for governor, believes schools need the freedom to set their own educational curricula. He would provide the opportunity to end traditional education after 10th grade and allow students to choose whether to enter college, begin a trade or apprenticeship program or get started in the workforce. They would still be able to access educational funding set aside for the last two years of high school for seven to 10 years. He also opposes unfunded education mandates from the state and calls for a significant reduction in required administrative positions. Cuomo announced The Excelsior Scholarship in 2017. It allows families and individuals making up to $125,000 per year qualify to attend tuition-free at CUNY and SUNY two- and four-year colleges. As a “last dollar” program, it covers tuition left only after other grants and aid have been used and funds cannot be used for expenses like room and board. To qualify, students must earn 30 credits per academic year and alumni must stay and work in the state after graduation. According to a recent report, 20,086 students statewide received an award from the Excelsior program in the 2017-2018 school year. A recent report by Center for an Urban Future concludes that only 3 percent of public college students are able to take advantage of Excelsior, which had a 70 percent rejection rate, and that students in New York City are especially neglected. Hawkins says the governor’s plan doesn’t go far enough, calling it a “selective scholarship program that poorer students cannot afford to use, not a program for free universal access.” He calls for making SUNY, CUNY and community colleges throughout the state tuition-free and for the state to provide a minimum livable income for up to four years of post-secondary education. According to Pallas, Hawkins’ platform is certainly appealing because the governor’s plan “really isn’t enabling a lot of low-income students to go to school full time” since it requires 30 credits and because it doesn’t pay for housing or books. But he says the proposed expansions would likely be too costly. While Molinaro voted against a bill in the Assembly to increase the number of charter schools in New York, he came out in support of school choice in a televised debate with Cuomo. Cuomo has historically supported charter schools. The most recent state budget increased per-pupil funding for such schools, and as part of a deal that quickly followed the renewal of mayoral control of city schools in 2017, legislators agreed to a workaround of the charter cap by allowing the reuse of “zombie” charters and for the city, as well as providing MetroCards to charter school students when school starts before busing, among other provisions. Charter school proponents have also supported Cuomo, though some detractors claim he’s backed away from the movement of late. However, during the debate with Molinaro, Cuomo insisted, “I support charter schools, I support choice in education,” a sentiment with which Molinaro agreed. A New York Daily News review of records found that in the last three weeks, Cuomo accumulated $130,000 from those with ties to the charter school industry. During the same debate Cuomo said, “we have a terrible educational equity gap” between rich and poor districts, but Pallas points out that the governor hasn’t weighed in on the central question of whether the state’s financial commitment toward education is sufficient — something Nixon was pushing him on — and that Molinaro hasn’t exactly made education a focus of his campaign either. Hawkins makes no secret about wanting to stop charter-school expansion, viewing privately-managed charter school chains as a drain on public schools that increases race and class segregation. He wants to amend state law so local school boards, not the State Board of Regents and the SUNY Board of Trustees, would approve charter schools in their districts. Unequal and inadequate funding of public education. The Campaign For Fiscal Equity lawsuit by NYC is still unresolved after 25 years because of Cuomo’s resistance to providing what is needed. The Maisto (Small Cities) lawsuit by 7 Upstate districts also asserting inadequate funding under the State Constitution has also not been settled because of Cuomo’s resistance. Public school funding, based on property taxes, has led to some district spending three times more than others on their schools. And City Limits does not even question the candidates about this!